Tourists visiting photogenic old towns near Amsterdam are being given guides on good conduct to try to make life easier for locals, it's reported. The communities, known collectively as Old Holland for their windmills and historic buildings, are popular attractions for day trips, but the visitors don't always behave themselves. Now they're being given a list of rules which tells them, among other things, not to photograph locals without permission, drop litter or wander through private gardens, Het Parool newspaper reports. 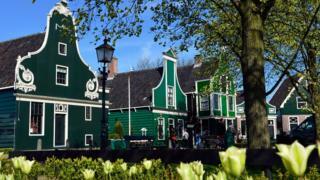 An open-air museum in the area, the Zaanse Schans, recreates aspects of 19th-Century Dutch life but is also a residential area - some of the village's historic buildings are people's homes. Its director says that can prove confusing for tourists, but some day trippers seem to do whatever they like. "I spoke to a resident who opened the curtains in the morning and found himself staring into nine camera lenses," Peter-Jan van Steenbergen tells Het Parool. "And visitors like to knock on the wooden houses to see if it's real wood. It's not very nice if you're the occupant." The new code of conduct is an attempt to manage the growing popularity of region, Dutch News reports. The Zaanse Schans itself welcomes up to two million visitors each year, and expects that to grow by 50% over the next decade.